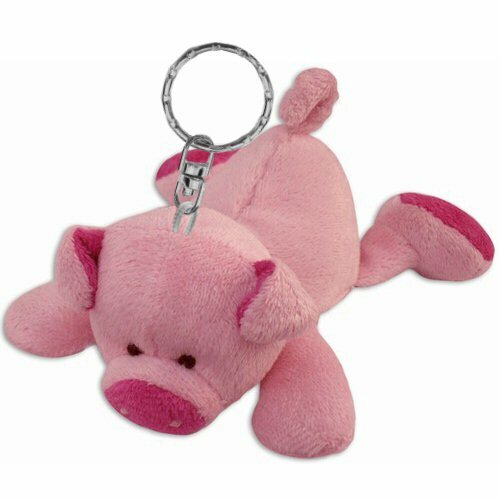 This adorable little pig plush keychain is ready to go to market with you tagging along on your keys, backpack, purse, belt loop, or even simply your finger. So easy to love, this pig stuffed animal keychain is cute and cuddly with soft pink fur, hot pink accents, springy curly tail, and sweet face. No worries about this plush piggy leaving a mess around the house, either, as this little oinker is perfectly content to simply lie on its tummy or sit up and watch you, when it's not hanging on your accessories. Having a farm-themed party? Pig plush keychains are also great for birthday treat bags! Famous Pigs: Most everyone remembers Babe, Wilbur, and Piglet, but how about Gub-Gub from Doctor Doolittle or Salomey from Lil Abner? Pickles, this Dreamy Eyes stuffed pig, has soft coral fur, adorable gray accents, and big sleepy brown eyes in an oh-so-sweet face. Stortster is a huggable plush pig with a huggable chunky body of soft pink fur, fun oversized feet, and a cute curly tail.